Two Sigma is a systematic investment manager founded with the goal of applying cutting-edge technology to the data-rich world of finance. 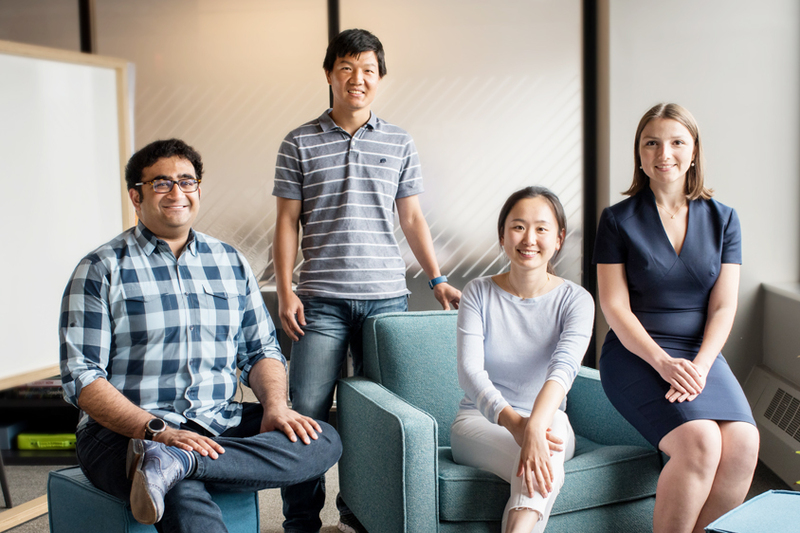 Raj, Cristina, Yuting, and Wenying have worked as quantitative researchers at Two Sigma for several years. Raj has an MS in Applied Mathematics, Cristina has a PhD in Physics, Wenying has a PhD in Mathematics, and Yuting has a PhD in Statistics. Learn more about these quantitative researchers’ experiences at Two Sigma. We often hear the phrase “that’s so Two Sigma” at the office - what does that mean to you? Can you provide a specific example or two? Yuting: I think it means geeky intellectual curiosity and passion for our work. Here's one example: My team often goes to lunch together. During a recent lunch, we began to discuss how to optimize our burritos. We assigned attributes to each ingredient as we do to financial instruments. We argued that sour cream could increase weight with the most flexible space constraint, but it would be hard to wrap with too much of it. Beans might be better than rice in this case. What kind of optimization algorithm do we use? What is the mathematical objective function and constraints? A discussion about burritos could be just as intensive as one you would hear in a conference room is so Two Sigma. Raj: A group of quants using order data from our kitchen snacks vendor to build a predictive model for how frequently we should re-order the most popular items… that’s so Two Sigma. Wenying: It means smart, nice and technology driven to me. One Two Sigma colleague proposed a change on the NYC MetroCard vending machine to provide the suggested amount to make the remaining balance a multiple of the single ride fare in NYC subway. How have you benefited from the collaborative work environment at Two Sigma? Cristina: What makes Two Sigma a unique place to work is that people come here with extremely varied backgrounds, all driven by a curiosity and passion to solve hard, interesting problems. We thus have people who are not only experts in their field but also excited and eager to share their knowledge with others. When faced with a technical or research problem that I don’t know how to approach, I’m able to reach out to coworkers in my team or in different teams who are happy to sit down and brainstorm with me the optimal solution. Yuting: The greatest benefit is that I’m able to learn something every single day. Statistics theory, a machine learning algorithm, a way to optimize python code, an open-source library someone discovered, public speaking skills, and even a trick to play poker! My brain has been nourished during every meeting, conversation, company event, and random catch up. Even a brief mention of a mathematical trick can save me hours of work trapped in my own thinking box. The fact that people at Two Sigma enjoy sharing ideas is intellectually stimulating and the collision of these ideas renders great creativity in work. Raj: I appreciate how everyone is so willing to go out of their way to help. Although I primarily focus on equity research, I once had an idea for a futures strategy. A coworker on the futures team spent several weeks happily responding to my near-incessant questions about futures modeling, teaching me everything I needed to know. I was happy to return the favor a few months later when he was working on an equities model. What background and skills do researchers need to be successful in their careers at Two Sigma? Cristina: The two most important skills for researchers to have are a willingness to iterate research ideas and a high level of comfort translating numerical models into code. Beyond these skills, researchers here have very diverse backgrounds and ranges of interests. People come to Two Sigma having studied Math, Computer Science, Statistics, Physics, Electrical/Mechanical Engineering, Finance or Economics. Some people are interested in working on non-traditional, niche data sets, while others look for an edge in processing traditional finance data through sophisticated techniques. Ultimately it is our diversity of interests and skills that makes us competitive and Two Sigma a fun place to work. Yuting: People who have solid quantitative analytical skills and strong motivation are more likely to be successful at Two Sigma. A good researcher also needs to embrace creativity and be eager to learn. Learn more about Two Sigma and their scientific method approach to investment management. The Mathematical Association of America thanks Two Sigma for their generous sponsorship.